Aa Dinagalu directed by Chaitanya and written by Agni Sridhar traces the incidents that occurred in the late eighties when two powerful dons -- Kothwal Ramachandra and Jayaraj ruled the underworld. Fortunately this film is free of any pretensions, and above all, it does not glorify the criminals or their criminal activities. Chaitanya has used a straightforward, simple narration resulting in a profound impact. Both Agni Sridhar, and Chaithanya must be complimented for their honest approach. The story of the film is based on an incident from the life of 'Agni' Sridhar -- a part of the Bangalore underworld in the eighties. His friend Chethan was in love with a girl whose father took the help of the don Kothwal Ramachandra to threaten Chethan. In turn, Sridhar and his friends approached another big Don Jayaraj for help. What happens in the film is best seen on celluloid because Chaithanya has handled the subject with a lot of caution and sensitivity. The background score by Ilayaraja is one of the best heard in the recent times in Kannada films. Cameraman H.C.Venu has done a terrific job behind the camera. His shot compositions, use of colours and lighting match the mood of the film. Chaithanya has proved his mettle as a director in his first film itself. Coming to the performance, even the artists who are featured in one or two sequences have done their best. Sharath Lohithashwa is wonderful as Kothwal Ramachandra, while Atul Kulkarni, Ashish Vidyarthi, Girish Karnad, and the new face Chethan have all given wonderful performances in their respective roles. New girl Archana looks innocent and fresh. 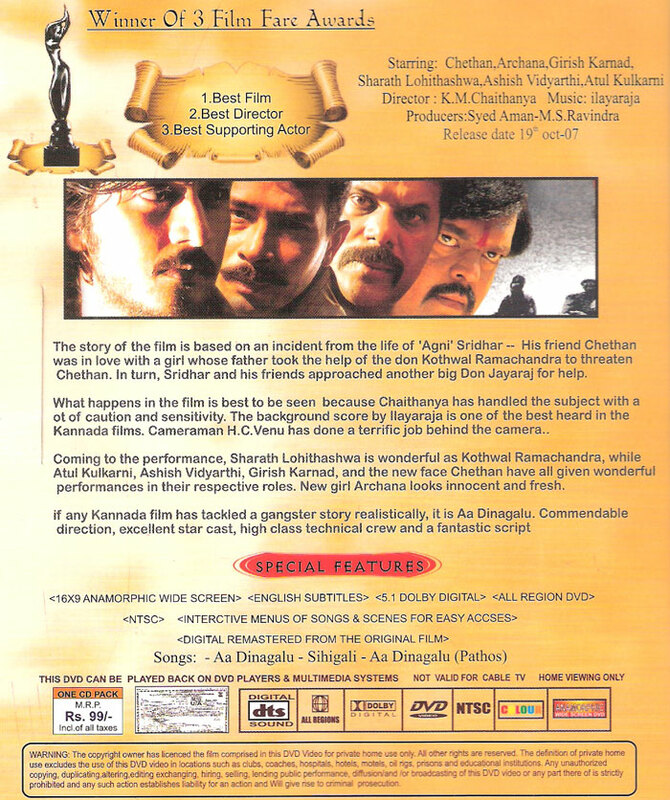 If any Kannada film has tackled a gangster story realistically, it is Aa Dinagalu. Commendable direction, excellent star cast, high class technical crew and a fantastic script; that is how we can sum up the film.